Around Ganesh Himal Trekking, an adventure for those who are tired and had enough of walking and visiting the popular and busy areas of Nepal Himalaya, where this marvelous trip leads you into hidden country of Gorkha and Dhading high hills with constant views of glorious scenery on daily walks. A mesmerizing adventure Around Ganesh Himal Trekking, which leads you at the bottom of massive Ganesh Himal Mountains that tower high above 7,422 m and 24,350 ft with its range south face of Pabil (Ganesh IV) which resembles an elephant, a ridge that is reminiscent of an elephants trunk and thus got its name as Ganesh, a popular Hindu God with a head of an elephant. Yangri is another local name for Ganesh Himal derived from local language of Tibetan origin the mountain of Ganesh Himal can be clearly seen from Kathmandu city and the valley on clear fine day towards North West along with Manaslu towards west and Langtang towards north. A blissful walk that leads you into complete wilderness in the harmony of scenic views within high mountainous and green hills covered with dense tall rhododendron, oaks, magnolia and pine trees where sometimes wild-life can be spotter from mountain antelopes to endangered, elusive Red-Panda that makes its home around the forest of high Pansang Bhanjyang where walk leads you on this highest spot of the adventure at above 3,850 m high overlooking grand panorama of Ganesh Himal, Manaslu, Langtang as far towards Annapurna range of peaks. 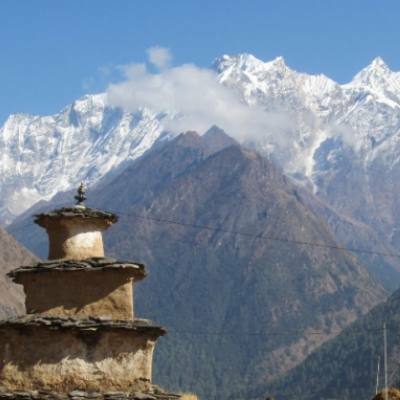 Starting this wonderful Around Ganesh Himal trekking taking a scenic and exciting drive from Kathmandu to reach remote and isolated of Dhading and Gorkha areas, where walk leads into quaint sleepy farm villages with fine terraced fields of crops with views of snow peaks. As walk progress leaving human settlement and villages for few days into complete isolation within pristine environment of mountains and hills with the sound of nature, enjoying great time around and being on off the beaten tracks, and then heading towards warmer low areas of Nuwakott district at busy Triusli Bazaar and town for interesting short drive to Kathmandu with marvelous experience and adventure Around Ganesh Himal Trekking. 1 Day 1: Arrival in Kathmandu and transfer to hotels.On reaching Kathmandu Tribhuwan International Airport where you will be warmly received by our guide and staff and then transfer you to your respective hotels in the hub of Kathmandu city. First check into your hotel rooms on getting refreshed from the flight and with Jet-Lag, then join with other members of Around Ganesh Himal trekking for group briefing, where our expert guides will inform regarding your stay in Nepal, hotels, trekking, local lodge and overland drives with do’s and don’ts information, evening welcome group dinner in authentic Nepalese restaurants with Folk cultural programs to entertain you during your meals. 2 Day 2: In Kathmandu with sightseeing tour around world heritage sites.Morning after breakfast leave the hotel for exciting guided sightseeing around Kathmandu where our city guide will lead you to places of interest, Kathmandu a metropolitan city still retains its ancient heritage and varied ancient culture where you will visit world heritage sites around Kathmandu for half day or full day. After an interesting and wonderful tour of ancient historical and religious sites around Kathmandu, with afternoon free preparation for next day early morning drive to Nepal North Mid West. 3 Day 3: Drive to Arughat 645 m via Gorkha-Dhading areas - 06 hrs.Morning an exciting overland drive on Nepal’s most busy and popular highway, as drive leads past West of Kathmandu valley, where our route diverts from the main road to reach around Dhading and Gorkha districts to reach warmer sub-tropical areas at Arughat for overnight stop in this country town with many shops and stores with several lodges and guest houses. 4 Day 4: Trek to Manbu 1,320 m - 06 hrs.First day walk begins on leaving behind Arughat low areas heading higher to reach a nice farm village of Arkhet with cultivated paddy terraces filed, after a short refreshing break, heading to cross over Buri Gandaki River towards Dhading area to reach our overnight stop at Manbu village offers grand views of Himal Chuli and Bouddha Himal. 5 Day 5: Trek to Lamo Dhunga 2,230 m - 06 hrs.From Manbu walk to Dhunchet village where climb leads past farm villages and forested areas to Dhunchet for possible lunch stop, with refreshing stop afternoon walk leads to a climb for an hour on winding trail with few smooth portion to Lama Dhunga for overnight stops with camping facilities in tents with views of mountains. 6 Day 6: Trek to Nauban Kharka 2,755 m - 06 hrs.After Lama Dhunga, walk enters into deep forest and crossing streams on leaving the village with gradual up for few hours to Nauban Kharka for overnight camp, (Kharka means cattle herders shades) a nice and pleasant spot offering views of Himal Chuli and Bouddha Himal with Manaslu range of peaks. 7 Day 7: Trek to Yarsa 2,580 m - 05 hrs.Morning starts to cross a small pass and a ridge Nauban Bhanjyang above 3,110 m high which takes an hour climb offering magnificent views of snow capped peaks, from here descend to reach a small place called Khading with super views of Ganesh III-IV, on reaching at Khading walk continues for another hour downhill to Yarsa for overnight camp. 8 Day 8: Trek to Timila 1,760 m before Tiri-Gaon village - 06 hrs.Having time to enjoy fantastic views of peaks, walk continues with steep uphill to climb to reach at a place called Kupchet, and descend to Lapche and cross a stream to reach at Kapor Gaon, from here a nice gradual walk to Timila where overnight camp is set on a small primary school premises which is a mere distance from Tiriga-Goan village. 9 Day 9: Trek to Chalisa 1925 m - 05 hrs.From Timila walks starts towards Tirigaon, and then a few hours trek on gradual winding trail to reach at Tatopani ‘hot spring’, here stopping with opportunity for a bathe in refreshing hot spring. After a pleasant stop walk continues for an hour to Dudari Khola and then uphill to reach a high ridge up at Chalisa for overnight camp, located above a farm village which offers excellent views of rolling hills with snow capped mountains. 10 Day 10: Trek to Marmelung Kharka 3,195 m - 06 hrs.Morning with time for tour of the old monastery and then downhill to Tipling River valley gorge, after crossing a bridge a steep climb to reach Tipling, from here climb continues for another two hours to Marmelung Kharka for overnight stop. 11 Day 11: Trek to Pangsang Bhanjyang 3,850 meters - 04 hrs.With pleasant stop at Marmelung Kharka, a short day today as morning starts with a climb into a forested ridge to reach our highest point of the adventure above 3,850 m high at Pansang Bhanjyang-la pass with marvelous panorama of Ganesh Himal, Manaslu range and as far to Annapurna. At Pangsang la for lunch and as well for overnight stop along with views of mountain range, afternoon free to explore the virgin and unexplored areas by other trekkers. 12 Day 12: Trek to Rupchet 3,055 m - 06 hrs.After crossing Pangsang Bhanjyang and then down and ups with few switch backs from one side of the ridge to another hill, offering superb views of awesome scenery with mountains and valley, after a dramatic downhill ending the walk from high Tiru Danda to descend into rocky gullies reaching at Rupchet for overnight camp. 14 Day 14: Trek to Deurali 1,500m - 05 hrs.Morning walk leads traversing past terraced fields of crops, and then leading to cross a steep little pass then into lovely forests to reach at Boldu-Gaon village, from here on leaving behind the village continue on winding path downhill to scenic cultivated crops fields of Deurali village for last overnight camp of the adventure. 15 Day 15: Trek to Trisuli Bazaar and drive back to Kathmandu - 06 hrs.Our last day of adventure walks around Ganesh Himal, where morning trek leads to Trisuli bazaar, as our route leads with descend into fields and terraces, a great change of vegetation within sub-tropical climate growing bananas and oranges with big and large pipal and banyan trees. After a good nice last day walk of the adventure reaching at thriving bazaar of Trisuli town, from here an interesting drive leads you back at Kathmandu, as the drive twists and turns through ridges and bends around Luchhe Danda, then descending to Kathmandu and reaching back into your hotel by late afternoon, with rest of the day free for individual activities and shopping. 16 Day 16: Depart for international flight home ward bound or to respective countries.With last memorable day in Nepal, after a wonderful experience and adventure Around Ganesh Himal Trekking, with great service of Explorer Adventure as per your international flight and then transfer to Kathmandu international airport for homeward bound or towards your next respective destination countries. Highest elevation gain: At Pansing Bhanjyang above 3,850 m high. People and Culture: Mostly Tamang tribe with Gurung and Magar people of Buddhist religion, culture with age-old custom, lower areas of mixed people of Buddhist and Hindu cultures. Walking Hours : From minimum 4 to maximum 6 hrs. Season: April to June and September to December months. March to May wild flowers in bloom with clear morning might get cloudy late afternoon times, October to December clear days for views but can be very cold in the morning and night time above 18,000 m high.